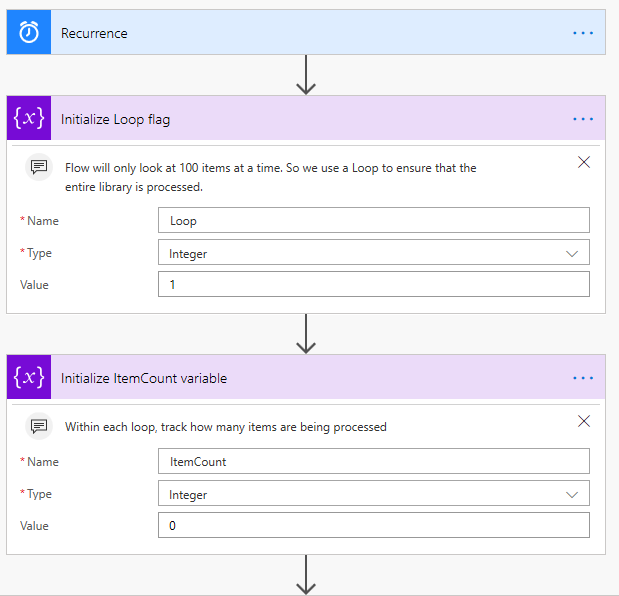 This Flow is built on the excellent post by John Liu (http://johnliu.net/blog/2017/8/auto-classify-images-in-sharepoint-library-via-flow) from 2017. Since then there have been some changes to the Flow UI and config options, plus some ‘real-world’ gotchas and implications that I felt needed addressing. This post re-uses much of John’s post, but updates it with the changes, clarifications and extensions needed to really make auto-image-classification work with the current state of the art. With personal thanks to John, @johnnliu, for permission to use his stuff. The new Flow is quite a bit bigger, with some changes in the way it does stuff. I have tried to make all the steps to build it as clear as possible, at the risk of being verbose, so that someone who isn’t at the top of their Flow game can follow along. The target image library must be a Modern Document Library (to which we added to Picture and Image content type). It wouldn’t work on a legacy Picture library. File size must be less than 4 MB. It took us ages to find the (surprisingly simple( way to do this. Folders are an issue and need to be skipped rather than analysed. Set up a SharePoint Online Modern Document Library, containing the Image and Picture content types, Picture Height and Picture Width columns to filter out oversize images and a Categories column to use the output from the Computer Vision API. 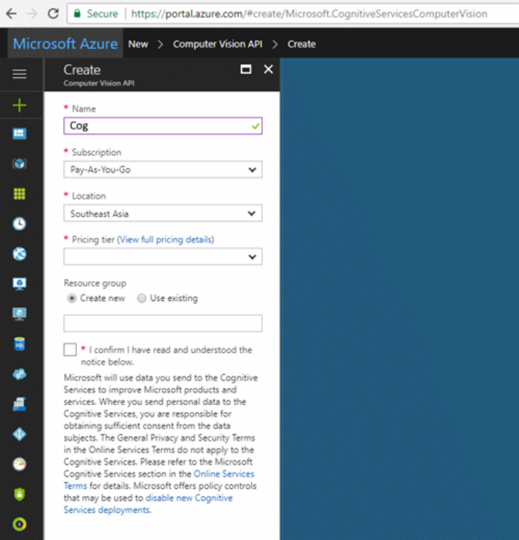 Firstly, work through the following to create a Computer Vision API Cognitive Service in your Azure account. The good news is that the Computer Vision API has a free tier which gives you the first 5000 transactions per month at no cost, so there may be no cost. Note that MS can change that if they want and it’s pretty easy to get carried away and use all 5000 during build, testing and initial roll out. This is how you will track and pay for your use of this part of Azure. Create a new subscription if needed (maybe a test and dev subscription initially), or skip this step if you are going to use an existing subscription. Click the Computer Vision icon and then Create. That’s it for Azure – just make sure that you check your consumption from time to time to avoid being caught out by consumption charges (though these are pretty reasonable). The SharePoint Document Library can be simple – it is just a standard, Modern library; however, it has a Categories column and we added the content types for Picture (we also use a content type for Image, which you can safely ignore). I also created a view to filter out file types that the service can’t analyse, such as .eps files and folders and to ensure that we have the right columns; it must include Picture Height and Picture Width columns. I called this view All Analysable Documents. 1. Create a new Flow. Start with a trigger, probably a Scheduled Recurrence that runs once per day, unless you want to kick it off some other way. You could start with a Manual trigger and swap it out later. Add a Get Files (properties only) action; this is one of the SharePoint actions, so select your Site (Documents, in our case) and then the library containing the images (Company Images). Open Advanced Options and add a Filter Query set to Categories eq null. This forces the Get files to ignore anything that already has data in that field. Point it at the All Analysable Documents View we created (select this in Limit Columns by View), so it ignores file types that Cognitive Services can’t handle, based on our view settings. When we started building our solution we spotted that Flow will only look at 100 items at a time in a library. A spot of internet research indicated that we would have to write our own routine to get it to iterate through a larger library and we came up with a neat way of doing that. After publishing the blog the first time the erstwhile John Liu pointed out an approach that was head-slappingly obvious; all you have to do is set the Top Count in Get File (properties only) to 5000 (there is some suggestion that this can be as much as 100,000 now, but 5000 is plenty for an image library). The original approach is pretty interesting though, so I have added it as an appendix. Now we need to look at each file in turn and decide whether to process it. Although we have set some filters via the View, stuff still sneaks through as the SharePoint View can’t get rid of everything. We will check for items that are folders instead of files, and whether the items have already been tagged. Then we will see if they are file types that Cognitive Services can process and whether the image dimensions are OK. We should check for the file size but I couldn’t find a way to pull that information without breaking the flow. Add an Apply to each action using value from before. For the No branch, I added a Compose action to let us check that we were getting the right things being blocked by the condition filter. I named it Debug – current values. You can safely ignore it. More importantly, there is yet another condition; this one looks at the IsFolder When True it drives an Update file properties action that writes the value Folder into the Categories metadata; otherwise it does nothing. There is a check needed later to ensure that the file size doesn’t breach the 4MB limit. For this we eventually realised that this property can be pulled using the Get file metadata This was pointed at the same site address as everything else, with the Identifier from Get files (properties only) step. This gets used in a compound Condition step in the Image size check section below. For the Yes branch, things now get interesting at last. Firstly, another Condition control also edited it in Advanced mode; this time it’s to confirm that the file types are one of JPG, PNG, JPEG, BMP or GIF (named accordingly). This function wraps all the options in an Or function, allowing everything to be checked in a single statement. Also, being unforgiving JSON, the case of the extension does matter, so we set everything to lower case with the toLower() command (and not the Lower command that works fine in PowerApps!). For this No branch, an Update file properties action sets the Categories column to Not Standard File Type. For each No branch, further Update file properties actions set Categories to Image size not supported (too large) and Image size not supported (too small) respectively. 5. Analyse and tag the image – finally! Having done so much set up and issue avoidance, we can, at last, get to the good bit. This is straight-forward compared with what has gone before. We get the file contents and throw those over to Azure analysis service. It delivers back a nasty JSON package from which we extract the suggested tags and set a confidence threshold on those tags so that low confidence suggestions are ignored. Then we convert the JSON to a string and concatenate each tag into a comma separated list of tags. Finally, we write the tag list to the Categories column; if no tags are found we write that instead. Grab the file content via Get File Content. Give it our site address and populate the File Identifier with Identifier (we got this from the Get Files (Properties Only) action). Add the Predict Tags from Image action. 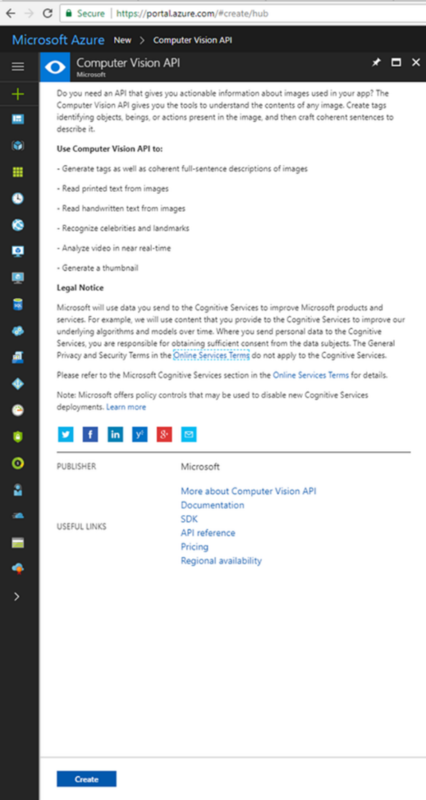 To do this, we need to set up the connection to the Azure Computer Vision service (read up on it here: https://emea.flow.microsoft.com/en-us/connectors/shared_cognitiveservicescomputervision/computer-vision-api/). 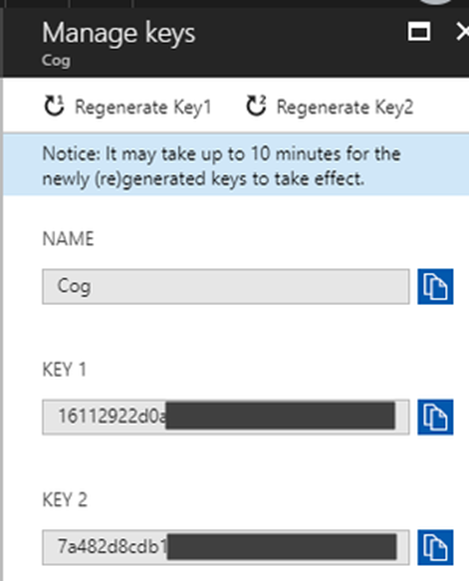 Add the Connection Name (CognCompVision) and the Prediction Key if required, which you made a note of when you set up Azure Cognitive Services, to have been set up. Click Create to enable the control. Pass it the image content using File Content from the previous step. Now we need to turn the JSON array into a comma separated list that we can add to the Categories field. Add a Select action; in the From field, use Body, which comes from the Filter step above and in the Map field we use Tag Name. Final step! 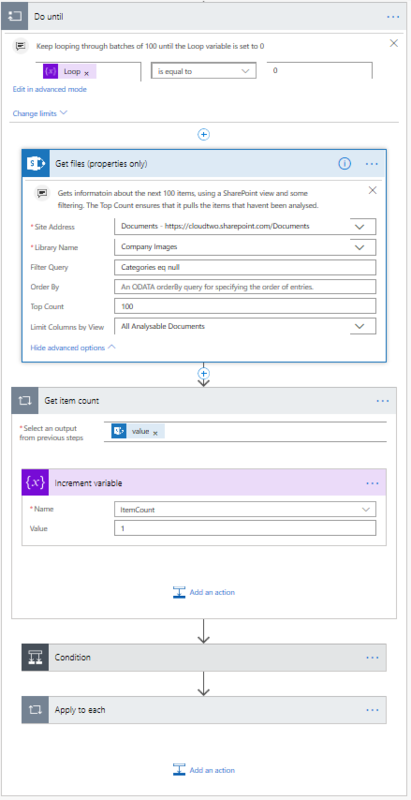 We don’t want trouble SharePoint Online any more than we must by trying to write anything if there were no tags found after applying the Confidence filter. So add yet another Condition action (our last!). We were going to use the Output from the Join step; set it to not equal to null. However we realised that the output from an image where all the tags have a low confidence isn’t Null, it’s Blank. Instead we checked for an output string length greater than 1 character (because that seemed simple). The Condition was used to check that the length() expression was greater than 1. For the No branch, add an Update action and set Categories to No tag found. For the Yes branch, another Update action writes the Output from the Join step to our images. And that’s it. If everything has gone well then now is the time to turn the Flow On and begin testing and tweaking the confidence value. I ran the updated Flow against a demo Company Images library with some pictures from a couple of talented photographers I know. And some of mine. Note the categories field is blank. Since we used a Run Daily trigger, the flow won’t appear in the library Flow drop down. Instead you trigger it from the Flow portal. It takes a couple of minutes to run, longer if you have lots of images or a slow connection. You can watch the tags appearing in real time in your library, which is nice. There are a number of things you need to do to get this working in your site. The most important ones are to carefully set up your library with the columns and views, which I described above. Note: some legacy sites just don’t appear in the Library Name dialog – the only way we were able to solve that was to recreate the library (I suspect that it is only Modern libraries that were created after Flow went mainstream that appear in the Flow library selector). Don’t forget to select the View you created in the Get files (properties only) step. Save frequently. The Flow interface is still not that stable and you don’t want to lose stuff. This happens all the time if you reset the target site, as the selected library becomes invalid and the UI crashes (do a save, exit to the Flow description using the back button, and re-edit that action, starting with deleting the ID string in the Library name). Name your actions. Every single one; no exceptions. You’ll be glad you did when you need to pick a value from a dozen similarly named Condition steps etc. Then go back and add descriptions – you’ll thank me (I also like flowers and chocolate) when you have to maintain the Flow in 6 months’ time. Check out the limitations. The Vision API can’t handle big images, small images and a bunch of file types for example. Folders are a real pain as they are sometimes treated as objects and sometimes ignored. Use the Compose action to track and debug. Vital when you are working out what fails where and for tuning the confidence value. Learn the Condition syntax for Advanced use. There are things you can do there that save multiple steps. A REALLY WIDE SCREEN monitor really helps. Flows are messy and lack elegant navigation in the current UI. You need a big screen to see it all. Super wide helps. Fewer Conditions helps readability. But we wanted to write different tags for the errors and multiple Conditions is the easy way to do that. There is a neater way to write different tags depending on the fail type, but that’s another blog. Documenting the Flow takes a lot of time. There is more time invested in this blog than in researching, building and testing the Flow. If you are required to document in detail then add another 100%. Enjoy, let me know about any bugs or any of the steps that aren’t clear. I’m sorry that it’s so long, but that’s kind of the point. Good luck! Feel free to extend it – notifications, on the fly resizing, additional tagging capabilities, renaming, text extraction, etc. could all be on the list. I want to seriously thank my colleague, Dan Wanless, without whose ebullient and patient help I would have abandoned this Flow a dozen times. And to another Dan (Westerdale), further thanks for patiently working through these instructions giving feedback and corrective errors and oversights. As mentioned, the default is that Flow will only read 100 items from a list. This is a technique for dealing with content in chunks; should that ever be necessary (but setting the Top Count means it shouldn’t be). In the following, we use a loop to ensure that the entire library is processed. We will use these to track the number of loops through the library the Flow makes in batches of 100, and track how many items are being processed within each loop. Open Advanced Options and add a Filter Query set to Categories eq null. This forces the Get files to ignore anything that already has data in that field. We make sure it processes the files in order using Top Count of 100. Finally, we pointed this at the All Analysable Documents View we created (select this in Limit Columns by View), so it ignores file types that Cognitive Services can’t handle, based on our view settings. Add a Condition control, to check if we have processed 100 items yet. Simply set the value to our ItemCount and make ensure it is less than 100. For the Yes branch, add a Set Variable action (which we named Set Exit Loop Flag) to set the Loop variable to a value of 0. Do the same for the ItemCount We only hit this branch when all files have been processed. For the No branch, add a Set Variable action (which we named Reset Item Count2) to set the ItemCount variable to a value of 0; but leave the Loop variable at 1. This ensures it will do another pass of 100 items. No right place – this is the biggest issue and most easily understood; folders force you to put a document or file in a single location, even if it might legitimately be associated with several places. A project report could be put in a folder with all the other documents for that project, or in a folder for reports, or in a folder for documents that are archived; in reality it should be in all three but that creates duplicates. SharePoint metadata would let you tag the document as being a Report, associate it with a Project, set its status to Archived and more. Different views would let you see (or hide) all Archive documents, all project reports, all documents that are not in draft that have be modified by me in the last 7 days and include the Technology tag, etcetera, etcetera. And you can switch between views with a single click. Usability – Unless you have a rigorous and actively managed file plan (and, let’s face it, no one actually does this well) then the folder structure is only known to the person/team who created it. Everyone else has to inefficiently browse the contents hidden in the folders in the hope of finding the document or file. URL length limitation – SharePoint builds the URL using all folder and sub-folder. However the URL length is limited to around 255 characters; beyond that you get an error. Deep folder structures simply break in SharePoint. Unfixed URL – Moving a file from one folder to another changes the file URL, so any fixed links to it will break. Security – You can use folders to define security for groups of files in SharePoint, however ongoing management of this is as big an administrative nightmare as it is on file servers. User experience – The user experience (UX, navigation, finding the documents) is marginally worse than it is on file servers – it’s slow, content is hidden until you open the folder. Moving content within folders is terrible within the browser, navigating between folders is horrible too. (though you can open the library in Windows Explorer). File duplication – Folders actively cause file duplication, partly because there is no one, right place for a given document or file (in fact you often have to put a file in multiple paces because folders are so inflexible), partly because you can’t see that the file already exists elsewhere. If you are striving for a ‘single version of the truth’ then creating duplicates immediately undermines this principle. A single view – One of SharePoint’s many great features is the ability to have multiple views of content, with the flexibility for users to filter and modify the view on an ad hoc, temporary basis. But not with folders, in a folder view you get just one view of your content and it is pretty poor, for the reasons above and below. Using metadata, you can create unlimited number of views by whatever properties you have setup (i.e. organize documents by date, by customer, by project, etc.) . Can’t Sort & Filter – Burying files in folders means you can only benefit from the sorting and filtering capabilities of document libraries and metadata navigation within the folder you are in. Inflexible – It’s hard to change the folder structure (though again you can use Windows Explorer), while changing metadata is easy and can be done as bulk actions. Lost documents – It is so very easy to misplace documents by putting it in the wrong folder and not knowing where it is. So then you create a duplicate copy, and the mess begins. Cost – If all you are doing is recreating the same mess of nested folders you had on file share within SharePoint all you have done is increase the cost (SharePoint infrastructure is more expensive than a file server) and you have cunningly avoided almost all the benefits of SharePoint. Visibility – the only way to know how active a folder is/how many documents it contains is to open it. It could be empty; it could have ten thousand documents; you just don’t know. A grouped SharePoint view in SharePoint using metadata shows many docs are in each group (and lets you carry out counts and other basic arithmetic on column values, such as Average file size). If there are no items in a group then the group doesn’t clutter up the screen. The power of SharePoint views – who needs folders when you can have groups, filters, metadata navigation and more? Data Integrity – There is little control over the naming of folders, so you can have spelling errors, non-standard conventions, unhelpful abbreviations etc. Metadata driven views can be driven by lists and taxonomies to avoid this. The only other reason for retaining is that you can’t get users to adopt the new, better way of doing things. At this point you have to use your judgement – generally staff work for the company and the company can dictate ways of working; there are rules for not operating machines without guards, even though they can be somewhat inconvenient for operators (until it saves one losing an arm); the digital health of your knowledge is as important. However if a team or individual chooses to stick with folders for their own content then that may be OK; as long as it doesn’t disadvantage other staff and that they aren’t wasting company resources (working time, support desk resources, computing time) in the process. A suitable policy for use of your intranet can address this – shared content, core business processes, managed information should not allow use of folders in libraries; personal and team working areas may use folders, but should avoid deeply nested folders, should also use flat views (where the folder structure is hidden) and must be actively managed by the team to avoid duplicates and misfiling. If you have had any interaction with Microsoft of late, you would be easily forgiven for thinking that. While I am an ardent lover of the power, sophistication and flexibility of SharePoint, I would concede that it is a complex platform and it’s very easy to develop ‘bad’ solutions on it that do not get great engagement from staff (unless done really well, which is what we do in Cloud2, but that’s a different story). So complex that MS were close to abandoning it as even they didn’t really understand what they had created. Then Jeff Teper came along and painted a new vision and the SharePoint garden is flowering nicely; however, that doesn’t get around the issue that it is a serious application that needs developing into a solution before it can be used. I even wrote a blog on how SharePoint is like Lego, but that was long ago in a galaxy far away. Meanwhile some folk at MS were playing and invented what became MS Teams, which provides a really simple experience for users, combining team chat (like Skype for Business chat, but with Slack like persistence and for persistent groups of people), combined with a Files tab and some other useful stuff. But you knew all that, didn’t you? You probably also knew that the Files tab is actually a SharePoint library and the act of creating a Teams Area spins up a full, linked SharePoint site collection. Teams Areas can have additional Channels, usually orientated around a work stream, activity or sub-team and these also have their own Files tab. However, go exploring these in SharePoint and it’s quickly apparent that each channel’s files are simply in a folder in the SharePoint library, with the same name as the channel. You can add metadata, views, content types etc in the library as normal; however these resolutely fail to appear in Teams (unless you manually add additional tabs that point at the libraries). Instead, the only way to organise your files within a Channel is to create folders and these become sub-folders in the channel folder in the library. Following so far? In Teams it’s all pretty simple; end users wedded to the noxious horror of folder structures can carry on regardless and no one has to train, encourage/threaten them to experience modern thinking on knowledge management (it’s only been 20+ years after all). Perhaps I’m being unkind; Teams is rather nicely pitched at the ordinary ‘Joe User’ who just needs to have a simple experience and do stuff quickly; there is nothing initially wrong with that. Except that these systems always end up growing to the point of dysfunction as more and more content is added; it’s a sort of Digital Peter Principle. Despite years of best practice, evangelism and dire warning about the issues of folders (and everyone’s’ personal experience of how badly broken all shared drives on file servers are), MS have created a brand-new monster. How we laughed. One of the cool things about Teams, is that it is fairly extensible; you can add new tabs, link stuff together, use content from other applications via connectors; even fire up workflows and embed applications in tabs. You can also bounce people up into ShrePoint for all the sophisticated stuff about 20% of use cases will ultimately need. But if you allow your information architecture to be screwed up then it’s a nasty, soulless job to fix it for that 20%. What you really need is some way to bridge the gulf between a fast-adoption, simple-to-understand Teams experience and an enhanced, life cycle-managed, compliant SharePoint one. Your users (mistakenly) want folders, your organisation needs metadata. It is triggered overnight or whenever new content is added to the Teams Area library. It uses the Is Folder function to identify the Top Level folder name in the folder tree (which will be the Teams Area Channel) and use the Update function to write this into a Channel column in the library for each document. It uses the same Is Folder name of the immediate parent folder of the file and Update that into a Category and/or Keyword column. Until such time as Microsoft do provide full metadata and view support in the Files tab (it’s coming, they claim) then we would add the library into a further tab, to allow a rich navigation of content as required. Is Check in/Out still relevant in 2018? SharePoint is a marvellous piece of technology, offering a massive breadth of tools and some especially neat ways of managing documents and other content. It also includes some legacy features which have become largely superfluous, but which some organisations cling onto, not realising how best practice has moved on. This blog considers one of these, Check In/Check Out, why it should almost never be used and the few occasions when it still has a role to play. As with most things Microsoft, the level of integration between different elements of the Microsoft stack is outstanding, and it often seems that the entire suite of Microsoft products advances in strict lock time, each taking advantage of the new features of other parts. There have been notable exceptions over the years, or course, but that’s the subject of a future blog. Frequently, the collective improvements border on being a revelation, if not a revolution; they offer the possibility of radically changing business processes and supplanting previous good practice with better practice still. One such ‘aha’ moment was the introduction of multi-author editing into Microsoft Office, and especially Microsoft Word, using the capabilities of SharePoint and OneDrive to handle the streaming of document updates in almost real-time. This is such a brilliant thing that it’s hard to imagine a world without it. However, prior to its introduction 10 years ago, we were burdened with a world where we either emailed documents amongst people and hoped to reassemble them, painstakingly and not without error, from the arbitrarily edited and often conflicting versions; or else we did the smart thing and saved them into an early version of SharePoint so that we could all work on a single copy of the document. Best practice, back then, was to check a document out while you’re editing, this locked the document and ensured that we didn’t experience the pain of conflicting edits where someone else saved their changes over yours, eradicating hours of important work. However, best practice or not, ‘Check Out’ and ‘Check In’ are, much like folders, an invention of Beelzebub, historically necessary but deeply evil. They serve their purpose to protect the document from overlapping changes, but they do nothing to protect hopeful document editors from colleagues who check a document out, forget about it and go on holiday, usually for two weeks (often more in Europe). Time and again, check out has been demonstrated to erode efficient editing processes and to create a real governance and compliance risk. Checked out documents cannot be further updated by others; when such updates are needed in a hurry (usually not long before an audit is due), the only recourse is to create a copy of the document and work on that. This practice deeply undermines the single-source of truth philosophy that should underpin good content management. Of course, you could call a SharePoint administrator and ask them to cancel the check out; but that’s slow, burdensome on the admin and inevitably means that whatever updates that the check-out miscreant had (lovingly?) crafted are lost. Thankfully, we are living in a new decade, where multi-author editing is a standard feature of the Microsoft technology stack and operates so slickly and transparently that it’s a doddle to use and it’s comparatively hard to screw up. When using Word and its kin, you can see who else is working on a document, see which bits they are editing and see their changes appear almost as they type in most cases. You can even contact the other author directly from the document to clarify wording etc. or flag a point to them using an @mention in a comment. Documents are never locked, version control and version history ensure that previous versions remain accessible and roll back is simple if required, tracking of edits ensures enhanced visibility and review. It’s bloody impressive and major step forward in productivity and compliance, doubly so if you have a distributed team or ‘agile’ timelines. A lack of active learning about the technology across the organisation has resulted in no one realising what the new tools can do. This is a shame, especially as you are paying for all those new features on an annual basis if you have a cloud-service subscription. Given that the technology costs can run to £manyhundredsofK for larger organisations it seems that a bit of investment in getting ongoing and increasing value from the tools would be wise. Inflexible culture might to be to blame; I do come across “it was good enough for my grandfather” organisations, where they hang on to the old ways because they were fine in the old days. However, I don’t see so many of these any more, since most of them have gone out of business. It’s a rapidly changing, hugely competitive world and organisations need to flex with it. Including public sector ones, who owe the tax payers a duty to spend money wisely. Inflexible processes, where it’s so hard to change something that has been written into a policy or procedure that only critical changes are pushed through. Actually, this is often another symptom of the culture and has identical outcomes. Someone in IT or the outsourced services department decides that Check In is the right thing to do, that it is somehow safer or better. I can think of a handful of scenarios where this is actually true. But the other 99% of the time it’s nonsense and professionals or consultants who are paid to know better telling organisations that they should base their policies on it should be a criminal offense (I would make it a capital offense, but I’m a liberal kind of guy and reserve that for only the most heinous of crimes, such as Folder abuse); or at least ground for renegotiating contracts. The bottom line is that organisations should have Check In/Out turned off as the default position. Version Control is generally already on (almost certainly true already if you are using SharePoint Online) and every version of Microsoft Office from 2010 onwards supports multi-author editing which ensures that changes are seamlessly managed. So, go and check all your libraries now and turn that option off. It’s in Library Settings, Version Settings. Think about your version control settings while you are there. If you think you might need to use Check Out then have a conversation with someone about the specific use case and see if you can really justify it. If you are stuck for someone to ask, drop me a line – but don’t expect an easy ride. It would be fair to say that I have become something of a Teams convert. Maybe even an evangelist. With that in mind, here is a round up of what I consider to be some good and best practice for use with Microsoft Teams. Teams is so new that new features are emerging all the time and use cases and associated practice are also emerging, so any of this is subject to change. Turn it on! You can do this in the O365 Portal and you can assign licences to all users or a selection. PowerShell scripts can help if you need to be selective. Call each team in Teams the ‘Teams Area’ or ‘Area’ for short. The language gets really messy otherwise. It’s also useful to add the date it was created, so dormant Areas can be removed. Remember that each Area also gets an email address. Make sure these group addresses don’t conflict with existing email groups. If you want a SharePoint Site, but also use Teams then make sure that you create the Teams area first; it will create a group and a Modern SharePoint site for you. You can do it the other way and link a new Area to an existing site, but only of that site has a Group already. Ensure that someone reviews the range of Teams from time to time and ensures that they meet the naming convention, as well as removing dormant or duplicate Areas. Check that every Area has more than one owner, just in case one of those knocked over by a bus scenarios happens; or that the Area owner is on leave. Use Channels to separate out different workstreams, topic areas etc. Remember that there is currently security at the Areas level but not at the Channel level. Anyone in a specific team can see all the content of all the channels in that Team Area. Don’t share sensitive Areas; consider having a second Area for each external person or group you share with. Use the Move or Copy function to shift files etc between the two. 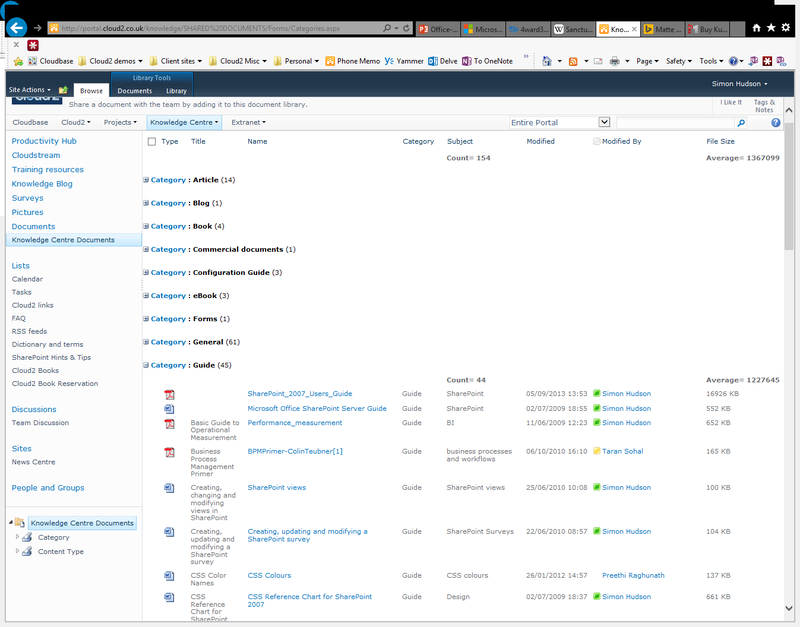 Add pages, applications and SharePoint libraries and Lists as tabs in channels, to create a joined up working environment. Add metadata to the libraries (via the SharePoint site), even though it doesn’t currently appear in the Files tab in Teams. It will at some point and you’ll be glad you have the extra control, filtering etc. In Select the user/license type you want to configure, select Guest; Click or tap the toggle next to Turn Microsoft Teams on or off for all users of this type to On; Choose Save. Don’t forget that every Area has an associated SharePoint site. Make sure users know how to easily access those; ensure that these sites are discoverable from within your intranet (i.e. add them to your navigation), and encourage Area owners to update and format their sites. It’s a good idea to create a SharePoint Hub site and associate all the Teams Areas sites to that hub. Keep conversations focused in the right channel and Area. Don’t say thanks etc to every chat; you can hover over the chat and click the Like icon if you want to acknowledge someone. Get familiar with the Security and Compliance Centre, so you can check that you users are following the policy. Check out all the add ins and connectors – there are many. Take a view on which add value and provide guidance to staff on these. ‘Favourite’ teams and channels for people, so that they can find the Areas they want more easily. Consider keeping a log /directory of all your Areas. Decline to travel to meetings; suggest that they can be done via Teams instead. Ensure the New Teams Meeting button is enabled in Outlook for 1-click online meeting creation. Ensure users have access to headsets. Do I really have to add metadata? It’s important that ‘information workers’ understand what metadata (often called ‘tags’) is and the need for capturing appropriate metadata for your documents and information items. Not adding metadata is initially quicker, but everything you do with the document later is slower and the chance of making a mistake is greater. Metadata is simply data about things, commonly documents and core data; it describes what something is and helps identifying it and allow it to be processed in useful ways. Depending on what you need to do, you would use a selection of metadata that allows you to manage what you know about this object. Clearly the specific search is more quickly finds exactly what you are after, but only if someone has added the metadata to the information. You may need to know more about this particular dog; things that aren’t obvious from the picture; how about its personality. It looks friendly enough, but what if the metadata for Personality says, “Extremely lively” or even “Vicious”. What about it’s health? Maybe metadata on it’s injections and vaccinations are useful things to know. It would be good to be able to see this about a variety of dogs, or even filter out those with undesirable characteristics for your particular purpose. Stop with the dogs, what about documents? If you attach the above metadata to the document, you can then group all documents that are appraisal documents, or all documents relating to a particular borough or a GP practice. Furthermore, you can group them by multiple categories, that way you can see all the documents for a borough grouped by GP practice and by category of the documents, not just as a long list of file names. Without metadata, it will just be a bucket where files are uploaded to and never found. With metadata, you can create different views of your documents and information to serve different needs; you can find the things you need quickly using search, and you can see critical information (such as whether the document has expired, or been sent to a client), without having to open it or check another system. It isn’t that hard to apply (Microsoft Word has a panel that lets you add it directly while typing up the document). It ensures large lists or stuff (documents, information, pictures, etc.) does get horribly messy, so that you can find things. It allows you to do things like archive all the old items, or assign them to someone else to update. It stops you having to use folders (which are an absolutely terrible way of storing most things). It makes like better for you, you colleagues and your company. Microsoft Search – isn’t that just Bing? Since when I have been reflecting on it quite a bit; and showing Microsoft Search to various people. I’m now shifted from “Hmmph” to “Gosh! Hmmm, that could really work”. Everyone I have shown it to has said it’s good – even my technosceptical wife. Microsoft Search, like so many good ideas, is a simple concept. Ordinary users rarely think to go to their intranet to look for things – they jump straight to a search engine – almost always Google. Diverging, for a moment, there is a well-worn process that architects etc. use when deciding where to lay paths and pavements; they wait a few months and then put them where the grass has been flattened by heavy footfall. Microsoft are doing the same – instead of plaintively pleading with people to go to where Microsoft would like them to be, they are putting the things tools where the people are already going – it seems that Microsoft have learned, at last, that they can’t dictate behaviour to end users. With Microsoft Search, they are putting corporate search where the users are, rather than trying to force users to the intranet, where the company search has traditionally lived. Microsoft Search cleverly returns results from across Office 365 as part of the ordinary search engine results. The caveat is that the search engine has to be Bing, not Google (more on that later). For the user, it’s as simple as opening a browser (probably Chrome or Edge) and typing their search into the search box or address bar. At the top of the results they get are items from across their Office 365, including SharePoint, OneDrive, Yammer (and soon to include Teams, Stream etc.). There are even some fancy recommendations, branding and the ability to limit the search to files, sites or conversations. The only thing the user really needs to do is ensure that they have logged in to the browser with their work credentials, and presumably this is something which can be automated by canny IT departments. For the IT department, there’s a little bit to do but is not too onerous. They need to set up Microsoft Search from the admin portal, which is available via the Office 365 admin centre. From here it’s possible to apply a branded logo and colour, as well as provide some search suggestions to get people used to the concept. There other neat features here, including the ability to build out question-and-answer sets (which is almost certainly using Azure QnA Maker), define bookmarks for recommended links (and import SharePoint best bets where this concept originates), alongside the expected management capabilities. It is also likely that IT will want to push out Bing as the default search engine using group policy. There’s probably a piece of work to do to reassure users and management that this is not exposing corporate information to the Internet. There’s bound to be a few raised eyebrows at the use of Bing. However, the choice of Bing versus Google is a bit like being forced to choose between a Maserati and Ferrari; they’re both really rather good, even if you’d rather have the Ferrari. Let’s think about this for a moment. Microsoft have lost the battle against Google on the personal desktop, even though Bing is a perfectly adequate engine. But in the corporate space they might just win it with this move; there’s no real downside to this choice of search engine and the ability to present corporate content is a huge win. Organisations actively need their users to be accessing curated and governed company knowledge rather than finding out things from the Internet. They don’t even have to force users to use Edge if they don’t want to (though it has become an excellent browser over the last year); every decent browser lets you define the default search engine. Users will love it, so they will use it. It’s quick, doesn’t require any training and shows user relevant results that they would otherwise miss. Plus it takes zero effort or knowhow. It increases the chance of users finding what they need, while improving compliance and governance. It provides richer results than just an Internet search, including finding people and conversations, not just documents; this can include specific bookmarked content and frequently asked questions. It’s probably better than their current intranet search, in fact. If we place this release alongside the rapid rise of Microsoft Teams (allegedly the fastest adopted application Microsoft has ever built) and the rapid shift to mobile apps, and it does beg the question of the role of an intranet in general and the value of the intranet home page in particular ( especially as it relates to SharePoint). A decent intranet attempts to pack search, news, applications and interactive content onto the homepage, while team and departmental collaboration sites lurk within the structure. However, modern SharePoint Online sites seamlessly push news content to the SharePoint mobile app, ready to be consumed by users on their Android or Apple phone. The recently promised option to add custom applications into Microsoft Teams (which is equally happy on the desktop or the mobile) means that the majority of users may never need to touch the browser-based intranet, other than via the mobile application. This means that they will never see the homepage. It may take a few years, but is now easy to imagine a future where the current concepts of an intranet are genuinely thing of the past; users will simply have no need to go to a ‘stuffy intranet home page’ for the vast majority of activity, they will be using Teams for collaboration, interaction and business process (perhaps supported by custom Power Apps) and consuming content via the SharePoint app (until it gets called something else). The role of the SharePoint partner or internal developer will change it again, with even more emphasis on strong information architecture to support intelligent content and coordinate the rich ecosystem of content, communication, collaboration, business process and people. Advanced content management will underpin everything, but the user experience will happen somewhere else entirely. You can find out more about Microsoft Search here and on the site Bing or set it up via your Admin Portal if you are already in Office 365 organisation. Microsoft Word has a fantastic feature that lets you embed SharePoint metadata in the document. This really encourages users to fill in the important metadata and lets them do it in the context of the document as they are working on it. You can also do neat things like embed a client or project name throughout a template and have all users of that be updated automatically. All you have to do is choose Insert|Quick Part|Document Property in Word and it shows a list of all the metadata columns in the associated SharePoint library. There is a bit of a problem with this however. Frequently your field shows an apparently random number and not the metadata you were expecting. This happens if you choose a field in SharePoint which is a Lookup column. When you choose this type of Quick Part, Word goes to SharePoint and the Library for the full set of options for that metadata column. The Library then gets this from the Lookup List. However, it does this based on the default view for the List. If your default view in the List does not contain the column you are trying to lookup it can’t complete the action and so just shows the item ID instead. The fix is relatively easy, once you know this. Just make sure that the default views in the List has any column headings that you might want to embed in your document. The good news is that it’s retroactive – so you can always go back and add extra columns to the view when you need it. So that’s it – just check your lookup lists have the correct columns in the default view. Then crack on and get everyone to fill in the document metadata as they create the document. Of course, they need to have saved the document into the SharePoint library first (even better if they create the documents from within the library in the first place).